PANAMA CITY — She spent much of her life in an indigenous village without electricity, using wattles to cross rivers and make it to her school in the poorest region of Panama. The hardships she endured as a child still make her cry. "I think that made me strong," she said of her upbringing, in a recent interview with The Associated Press. "Now, everything is falling into place for me." The title has opened doors on an international stage for her to denounce the marginalization of indigenous communities. A month after winning, Montezuma attended the U.N. Permanent Forum of Indigenous Peoples. She also spoke during the organization's International Indigenous Peoples' Day and took her message to the Organization of American States in Washington. Dressed in naguas — a long, straight indigenous dress of vibrant colors and geometric designs — Montezuma advocated for longstanding claims of native communities in the Americas and argued that governments "have a historic social debt with our native peoples." "We continue to be considered inferior, uneducated, discriminated against entirely by society in general for our clothing and our essence," she said in her speech. She has had to overcome opposition and discrimination even since winning. In Panama, some criticized her for wearing her traditional dress to the United Nations, arguing that people would think all Panamanians are "cholas" — a pejorative term common to Latin America and Latino communities in the United States. "That's a derogatory, racist comment," Montezuma told AP. Montezuma also faced resistance when she entered the beauty contest. 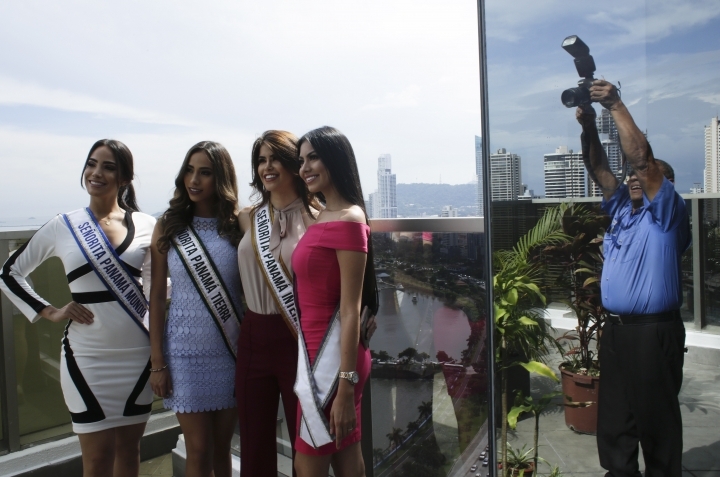 After her indigenous ethnicity was questioned on social media, she had to go with pageant organizers to a government office to get her identity documents and prove she is indeed Panamanian. Some had alleged, falsely, that her father was Italian. The 25-year-old is the oldest of three siblings born in the community of Alto Caballero in western Panama, in a region where modern hydroelectric plants are a stark contrast to surrounding villages where there is no electricity. According to a study, 67 percent of the more than 150,000 inhabitants of the Ngobe Bugle region live in extreme poverty. Seven indigenous groups make up 12 percent of Panama's population of 4 million. Statistically, indigenous Panamanians lag behind others in the country on indicators from economic status and education to access to infrastructure like roads and bridges. "Rosa has done very well for herself — not only as a woman in a beauty contest, it's about more than that," said Taira Stanley, a member of the indigenous peoples' office of the University of Panama. Montezuma recalled having to travel every two weeks far from home to a ranch school with wooden walls and a palm-frond roof where she studied and her mother was a teacher. It could be a perilous journey, and sometimes they would have to wait for swollen creeks to calm before it was safe to cross. When Montezuma first became a beauty queen as a first-grader during her school's anniversary celebration, the moment was marred when she learned her baby sister had been burned on her leg with cooking oil, forcing their mother to stay with the girl at a hospital elsewhere for a month. "Imagine, this was in a small town without doctors or medicines, difficult to access," she said. Montezuma's next challenge comes in December when she will represent her country at the Miss Universe pageant in Thailand. "This is so important to me," she said. Being Miss Panama 2018 "has been a platform for people to become aware that indigenous people are not just a group far from the city, and that they can achieve things."